Fisher Heights Community Place, at 31 Sutton Place, is available for rent by individuals, families, community groups, and other organizations. The entire facility, which can accommodate just over 100 people, can be rented for as little as $40 an hour. Alternatively, the Main Hall or Meeting Room can be rented individually (for meetings or similar programs only) for lower rates. Please note that no set-up, tear down, or janitorial services are provided. Renters must pay for all the time they are using the building, including set-up, tear-down and clean-up. And in addition to the fees listed on our rental rate chart, all renters must provide a refundable $100 cleaning/damage deposit. Rentals of the building are managed on a volunteer basis by the Community Association on behalf of the City. The Main Hall is the primary rental space in the building. It is rectangular in shape, measuring approximately 900 square feet. It can accommodate 90 people standing and 75 people sitting. Renters have free access to the community associations’s 15 six-foot-long tables, several square bridge tables, and close to 60 chairs, but are responsible for their own set-up and tear-down. The Main Hall can be rented for as low as $15 an hour; please see this chart listing complete rental rates. The Meeting Room is approximately 190 square feet. If set up lecture-style with chairs only, its capacity is no more than 20 people. If set up with tables and chairs, it accommodates 12 people comfortably. It features double doors which open into the Main Hall room and another door which opens into the facility’s hallway. 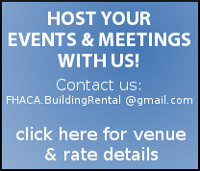 The Meeting Room can be rented for as low as $10 an hour; please see this chart listing complete rental rates. The building features a residential-style kitchen with a serving window opening into the Main Hall. It is equipped with coffee pots and urns, a kettle, cups, some cutlery, serving utensils, and a small number of large dishes, bowls, and pots. Shared access to the kitchen is included with the rental of either the Main Hall or the Meeting Room. Exclusive access to the kitchen is included with the rental of the entire facility. This area is approximately 250 square feet. Because the building’s washrooms are directly off this space, it cannot be rented separately, but is available – except during the winter skate season – as additional space when a full-building rental is made.